Want to know the secret to study less for online courses and get better results? It takes the right study plan, focus, and intention. By tweaking your study habits you can make significant progress in every course with less effort. College is tough, and being an online student is even tougher. You are in charge of managing your time completely and don’t have the friendly reminders during class time that you have in the traditional college environment. It can feel overwhelming to keep track of everything you need to do for your courses on top of your work and family commitments. I also know that it can be done. It’s possible to be intentional with your study time, pack a lot into your day, and avoid the continually stress cycle. I’m confident about this because I lived it, working a full-time job while going to school full-time to earn my graduate degree. The core concepts of intention and focus are how I manage to accomplish so much each day without feeling overwhelmed. These simple skills allowed me to stay motivated while earning my college degree. I’ve heard it said that time management is really self-management. It is the ability to commit to doing something at a specific time and then following through on the commitment to yourself. But when you have a long day at work and a crying toddler who just fell asleep, it’s really easy to bail on your commitment to yourself. I know, ’cause that’s my reality too many days! When you honor a commitment to yourself, you create confidence. Right away. You can trust yourself to follow-through on the next commitment. And the next. And this allows you to achieve your dreams and earn your degree. Speaking of commitments to yourself, let’s take a look at your calendar. We don’t make progress on our studies because it doesn’t feel like we have enough time. We all have 24-hours in our day, so it matters how we think about our time. Have you ever noticed this thought process? I don’t have 2 hours to study, so I better wait until tomorrow. I planned to study 3 hours tonight, but I had to work an extra hour so I’ll just study tomorrow. Doesn’t it sound crazy? And yet we all do this! You are going back to college and making it happen while working. Basically, you rock. Based on all you’re taking on, I know college is important to you, and we equate importance with a big time commitment. It’s natural to look for huge blocks of time to devote to studying, but let’s face it, you don’t have huge blocks of free time. You’re balancing a lot in your life, and you have to work with what you have. Instead of trying to reinvent your schedule, start working with your current life and study in small, focused blocks of time. 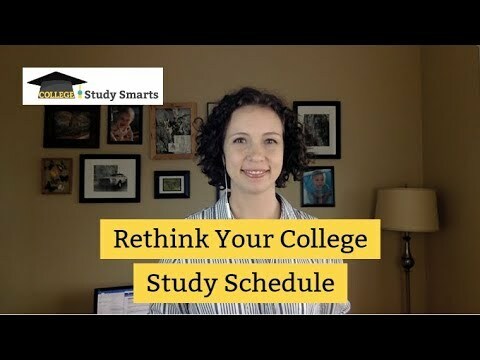 To get started, maximize your calendar and look for small pockets of time in your regular routine This may even mean figuring out how you can study at work (and not get fired). Having trouble getting started? Get your free study planner to map out your day and identify study times which already exist within your normal routine. What does it look like to study less for online courses? This schedule is totally do-able and still leaves time to work my full-time job, cook dinner, eat with my family, and relax before bed. It is quite literally the least I can fit in for the day. Use the planner to help you map your day out. Do this every single day and you’ve put in 7 hours of studying without breaking a sweat. You will need some longer blocks of time on the weekend or a slow night at home to focus on larger assignments, but these small blocks of time are significant and steady progress. They are what produces better grades. When you have a consistent daily study time each day you remember more of what you study. Plus, when homework doesn’t feel like an overwhelming task you will stay motivated and find you slip into procrastination less and less. Want to optimize your calendar even further? Check out additional tips on time management. The key to making these short study sessions work well is to be really mindful about giving your whole focus to the task at hand. If your phone is alerting you every 30-seconds you are not going to get a lot out of a 15-minute study session. Same thing if the TV is playing or your kids are asking you for snacks. You have to be intentional about what you are doing. We’re talking ninja-like focus. I am constantly telling my daughter that she can only do one thing well at a time. As I repeat this 98 times a day, I’m noticing it in my own life as well. There are far too many times I try to multi-task to the detriment of both things I’m doing. When I slow down and focus on one single task I can do a great job. With two tasks, it will be mediocre at best. If you have an hour to spend with your family, start by putting away your computer, phone, and textbook. Focus on conversation and having fun with your family. They’ll be delighted and you will feel refreshed. When you have 20 minutes to study, tell your family you have to step away. Then go somewhere quiet and immerse yourself in studying for the full 20 minutes. Again, no TV in the background and no alerts popping up on your phone. No multitasking. This is the key to study less for online courses and still get better results. When you hyper-focus on studying for 20 minutes you will accomplish more than if you multitask while studying for 60 minutes. Try using a simple timer to aid your focus, using the Pomodoro technique. Now you have identified when to study and have put away all distractions so you can study you have a solid foundation in place. But knowing when to study is just one piece of the puzzle. You also have to optimize the work you do when you are studying. The first skill to focus on his taking better notes. They are the foundation for reviewing and key to study less for online courses. Read through the note-taking series and understand how to get started with awesome notes. When done right, your notes will help you breeze through exams. Once your notes are perfected, then you want to focus on your memorization skills. You have to transfer the knowledge from your notes into memory, and don’t forget to keep revising your notes so they work for you.